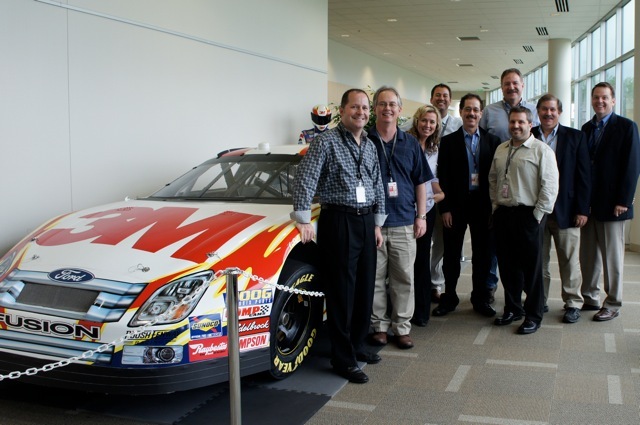 At 3M’s Innovation Center in Minneapolis, MN with (from left to right) Dr. Mike Barr, Dr. Tim Goodheart, Jenn Robertson (Gold Dust Dental Lab), Pete Janicki (V.P. of Dentaltown), Dr. Howard Goldstein, Dr. Mike Colleran (tall doc in back), Dr. Rich Rosenblatt, Dr. Tim Burke and Dr. Tom Giacobbi. 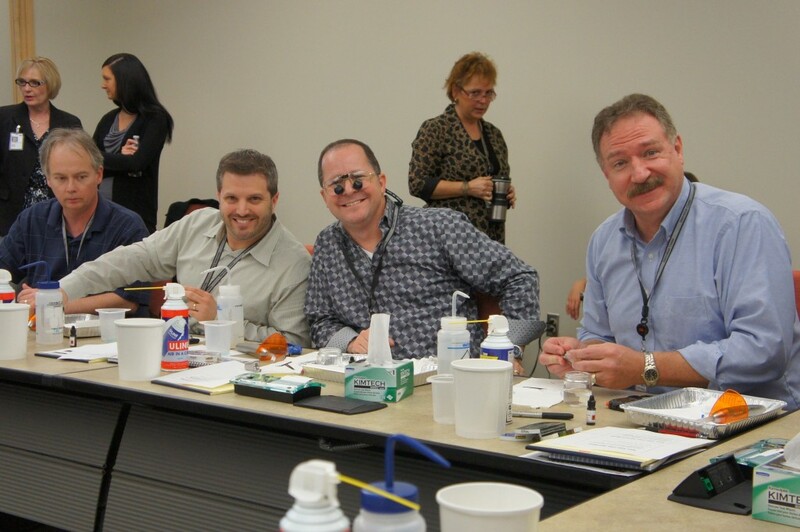 Battle of Bonds at 3M’s Dental Thinktank with Dentaltown clinicians (left to right) Dr. Tim Goodheart, Dr. Rich Rosenblatt, Dr. Mike Barr and Dr. Mike Colleran. Last weekend Gold Dust was privileged to be invited to a 3M dental “think tank” with some terrific educators on Dentaltown.com. The group was hosted by Peter Golden and John Stefanick of 3M ESPE Dental, and organized by Dental Town, to provide research and introduce what’s the latest and greatest, in the area of digital impressioning, a new value based line called “Paradigm” in the composite and VPS material categories, mini implants and some new materials coming down the line . As a company, the culture in committed to collaboration across all of it’s divisions. It is a little known fact, that 25% of the earth’s population comes in contact with a 3M manufactured product everyday. This company’s vision in supporting dental educators is second to none, with a proactive approach in directly connecting with it’s customers. The days were packed with a ton of information, hands on “Battle of the Bonds” and hands on use of C.O.S. We met with research and development teams, product managers, trainers and industry professionals to provide feedback as well as discuss emerging markets in dentistry and benefit from a great deal of 3M’s massive research into the marketplace. The most rewarding part of the visit was the camaraderie and insights of the clinicians that attended including Dr. Mike Barr, Dr. Tim Burke, Dr. Mike Colleran, Dr. Tom Giacobbi, Dr. Tim Goodheart Dr. Howard Goldstein, and Dr. Rich Rosenblatt. We enjoyed a night at the Twins baseball game courtesy of the 3M group and really enjoyed socializing with the whole group. Gold Dust has always been recognized as a cutting edge cosmetic dental laboratory and to be invited to participate in this 2 day event was a great privilege. This type of event is another way that Gold Dust continues to be a resource for their clients as well as maintaining the edge in industry knowledge, training and support.